Webio Description, the 1 minute pitch? Webio, The Conversational Middleware Company™ enables businesses and contact centres to engage with customers over existing and new messaging channels such as Facebook Messenger, Viber , WhatsApp and soon services such as Alexa and Google Home and existing channels such as SMS. Webio help customers do things (using above channels) like search, book and pay for products and services using a combination of AI technologies such as natural language processing and linking with payment processors as an example. Artificial Intelligence Driven Conversations for the Entreprise from Webio on Vimeo. There are a lot of things that we do that are different, one is that we bring true AI driven customer conversations to the enterprise. Our channel agnostic conversational interface engagement platform uses the power of AI driven chatbots, machine learning and NLP to introduce a ‘blended AI’ approach to customer engagement that lets AI agents work alongside human agents to seamlessly engage with customers. Our platform manages both outbound and inbound contact campaigns and can shift between channels depending on customer preferences and actions. In addition, we have recently launched our Webio Propensity Bots which uses the customer’s interactions along with its understanding of “the conversation” to predict the most likely outcome of each conversation, this could be for customer experience, NPS score, propensity to make payment, etc. Assessing and applying individual scores for every customer conversation, the Webio Propensity Chatbots interprets the customer’s language, response behaviours and previous conversation history to determine how best to manage and guide each interaction. This might be in the form of presenting the next best option to the customer using a combination of words, images, and options such as being serviced by a live agent. Because we have a great product and great team. Businesses need to engage with their customers in the manner and channel that they use, and large organisations have been lagging behind and are now trying to catch up. Webio has a solution that addresses these issues. Apart from successfully securing one of one of the largest seed capital investments of €2.2m for a technology start-up in Ireland in recent years. We have had some great customer wins already both in UK and US. We have secured the UK’s best loved digital department store and revamped existing SMS customer engagement and introduced new messaging channels into their contact centre. They are now able to deliver a seamless personalised customer online shopping experience for their logistics, customer service and collections teams. One of our other UK clients in the financial services sector were that delighted with our service we secured their US business in the past few months. 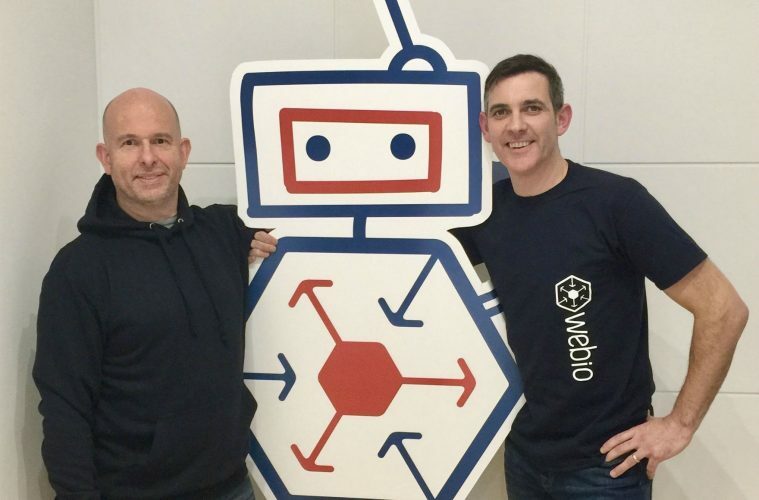 Proving that Irish tech companies are punching above their weight on the global stage, Webio’s latest success is beating over 200 companies to secure our place on the coveted Blackbox Connect 20 programme which is powered by Google. Any organisations who have a need to engage and manage a high volume of customers whether that is inbound or outbound engagement. Our typical customer is a large B2C enterprise that needs to manage in excess of thousands of daily customer conversations. We are working with clients in a variety of industries ranging from retail, financial services, hospitality and utilities and provide messaging solutions for marketing, customer service, collections and logistics. Focus on what your target market is and ensure you have a great product market fit for this specific market. The more focussed your on-target client definition the better, and always ensure you can articulate what value your products or services will deliver to these on-target clients. The value you deliver needs to be a tangible benefit to the business that needs to be money or metrics focussed. The executive team consists of Graham Brierton, founder and CTO, Cormac O’Neill CEO. Mark Oppermann, head of Sales and Marketing and Paul Sweeney who looks after product development. An experienced team with over 25 years’ experience in creating and deploying cutting-edge Enterprise customer communication solutions to customers in Ireland, the UK, mainland Europe and the US. Webio plans for the future are to ensure we continue our growth in our home markets of UK and Ireland. This would be followed by initial entry into US market later in 2018. Along with growing the direct sales we would also be looking to enter other markets with selected partners this would be European focussed first followed by the huge potential of the Asian markets. Would almost every person not have the same answer to this nowadays it’s the smart phone and the iPhone. Just calling it a phone or even smart phone is probably doing it a disservice as it takes part in some many aspects of your daily life it’s never too far away from a free hand. The interesting aspect of this is to see how much more the phone dominates the life of children and this shift to all things being centred though the phone isn’t going to slow down any time soon.